A MAN’S attempt to paddle 125 miles across Britain in a canoe has failed for the second time. Chris Bishop set off from Devizes in Wiltshire at 7am on Good Friday with the aim of reaching Westminster Bridge in London by Easter Monday. But the 52-year-old, who first attempted the feat in 2016, had to stop the following afternoon as the River Thames was flowing so quickly due to heavy rainfall that it was dangerous to continue. Nonetheless, he has raised more than £1,400 for Alzheimer’s Research UK in memory of his father Derek, who was diagnosed with early onset dementia in 2007 and died in 2014, aged 77. Mr Bishop, of Queen Street, Henley, and his rowing partner Paul Reynolds, a 54-year-old IT consultant from Skirmett, also raised more than £500 for Multiple Sclerosis UK. Donations for both charities are still coming in. The pair were taking part in the 70th annual Devizes to Westminster International Canoe Race as Team Forget-Me-Not. They successfully completed the first leg from Devizes to Newbury, a 35-mile paddle, in about eight-and-a-half hours before staying overnight in a hotel. They then embarked on the next stage, another 35-mile journey to Marlow, but were stopped at Dreadnought Reach, near Caversham, by the organisers. By then the water levels on the Thames were at a 40-year high in places so the event was scrapped and the hundreds of participants sent home. The men returned to Henley for drinks in the Three Tuns and the Angel on the Bridge, both of which kept collection tins on their bars. They then went to Mr Bishop’s home for supper with his wife Debbie. He isn’t discouraged despite also failing to complete the race two years ago, when he and partner Alan Bannatyne, from Bourne End, reached Hambleden lock before deciding it was too windy to carry on. He intends to sign up for next year’s race and will continue training both on the water and in the gym at Henley Canoe Club, to which he has donated their £2,000 canoe. Mr Bishop said: “We’d trained more than enough and knew what we were doing. The only obstacle was the weather and it shouldn’t be a problem next time as Easter falls later in the year. “I thought we’d been lucky to escape the big freezes in early March but there had been heavy rain in the days before the race and that built up the river levels. “We did really well on Friday despite strong headwinds and driving rain, which reminded me of 2016. “It didn’t begin that way and we were feeling pretty hyped up but it got worse as the day progressed. We also made excellent time from Newbury on the Saturday and averaged about 5.5mph despite falling in the water at Fobney Lock on the River Kennet in Reading. “We’d shored up at a bank which looked stable but a tree root had other ideas as we pulled away and we popped right out. “Fortunately, we were wearing clothes that draw moisture away from your body so we just carried on as normal. “The flow at County Lock near the Oracle centre was so fast that it looked like a boiling cauldron. “Canoeists were going through one at a time and quite a few were falling in, although we negotiated it successfully. “There were lots of people cheering us on as we passed the Oracle and after four hours of paddling the smell of food from all the restaurants was pretty nauseating. “We were disappointed at the cancellation and some entrants were vociferously against it but we felt it was the right thing to do as conditions were poor and canoeists could have got into a lot of trouble. 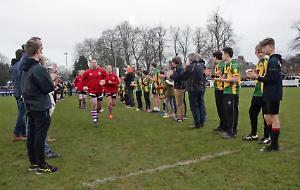 The men were supported by other Henley businesses including the Anchor, Café Rouge, Cannelle Beauté, Pachangas, the Chocolate Café, Patisserie Franco-Belge and Gabriel Machin.